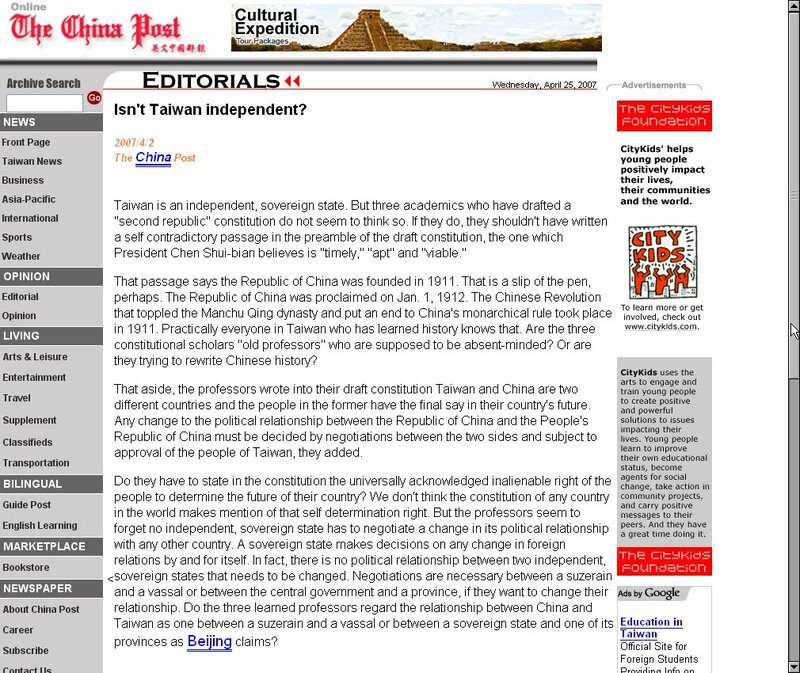 The fact that an ostensibly pro reunification oriented “tong pai” newspaper would make such an obtuse remark is one of the most serious problems on today’s Taiwan — hopeless befuddlement about the real world status of the Chinese province of Taiwan relative to the Republic of China (ROC). It’s bad enough that the Pan Green camp conflates Taiwan with the ROC. After all, the Pan Green camp is committed to the overthrow of the ROC and the establishment of an ROT (Republic of Taiwan). It has every reason to conflate Taiwan with the ROC. It has every reason to obliterate the distinction between Taiwan and the ROC. But what reason does the ostensibly pro reunification oriented China Post have for doing so? The fact that some “Pan Blues” seem to be as confused about this critical distinction as Taiwan independence fundamentalists is far more worrisome. The simple fact is, Taiwan is not an independent, sovereign state. Taiwan is merely part of a independent, sovereign state — the Republic of China. Taiwan is not synonymous with the Republic of China, and must not be treated as if it was. Ordinary Americans can be forgiven for dismissing these distinctions as unworthy of their attention, but ostensibly “pro reunification media” on Taiwan really ought to know better. These constitutional law distinctions lie at the very heart of the cross-straits conflict, and may spell the difference between lasting peace and nuclear catastrophe. These legal distinctions are not subject to “interpretation.” They are explicit provisions of the Republic of China Constitution. Taiwan independence leaders know this better than anyone else. They know it, and they hate it. They might try to deceive their fundamentalist supporters about Taiwan’s current status. They might repeat the catechism, “Taiwan is already independent!” But in their heart of hearts they know that until and unless they author an new constitution and declare formal independence, Taiwan will remain an integral part of China. That passage says the Republic of China was founded in 1911. That is a slip of the pen, perhaps. The Republic of China was proclaimed on Jan. 1, 1912. The Chinese Revolution that toppled the Manchu Qing dynasty and put an end to China’s monarchical rule took place in 1911. Practically everyone in Taiwan who has learned history knows that. Are the three constitutional scholars “old professors” who are supposed to be absent-minded? Or are they trying to rewrite Chinese history? That aside, the professors wrote into their draft constitution Taiwan and China are two different countries and the people in the former have the final say in their country’s future. Any change to the political relationship between the Republic of China and the People’s Republic of China must be decided by negotiations between the two sides and subject to approval of the people of Taiwan, they added. Do they have to state in the constitution the universally acknowledged inalienable right of the people to determine the future of their country? We don’t think the constitution of any country in the world makes mention of that self determination right. But the professors seem to forget no independent, sovereign state has to negotiate a change in its political relationship with any other country. A sovereign state makes decisions on any change in foreign relations by and for itself. In fact, there is no political relationship between two independent, sovereign states that needs to be changed. Negotiations are necessary between a suzerain and a vassal or between the central government and a province, if they want to change their relationship. Do the three learned professors regard the relationship between China and Taiwan as one between a suzerain and a vassal or between a sovereign state and one of its provinces as Beijing claims? Taiwan is not independent.Taiwan is a former Japanese cessionTaiwan is not part of the PRC, although many rabid Chinese imperialists claim that it is.China is irrelevant to Taiwan’s sovereignty.Taiwan is a cession which is occupied by a foreign power.It is precisely how the US state dept. describes it. They said that “Taiwan does not enjoy sovereignty as a nation” and that “it’s status is undetermined.” It was ceded by its previous owners, Japan, in the San Francisco Peace Treaty in 1952. There was no recipient of Taiwan’s sovereignty named. The USA was named in the treaty as the principal occupier. By the laws of war, the principal occupier holds the territory’s sovereignty in trust and have the power to decide what to do with it. Thus, Taiwan’s sovereignty is held by the US untill further notice. The sovereign title to a territory is determined by the relevant treaty. A treaty is like the deed to a house or the title to an automobile. Treaties are the highest law of the land, equal in force to the constitution itself. The relevant treaty regarding Taiwan’s present title of ownership is the San Francisco Peace Treaty.The US, being the conquerer of Japan in WW2, had authority over all Japanese territory, including Taiwan. They delegated the receiving of the surrender of Japanese forces on Taiwan and the subsequent occupation to the ROC since 1945.In 1949 the ROC lost the mainland to the PRC and retreated to occupied Taiwan to set up their Government-in-exile of China there.It’s key to note here that under international law, there are NO actions which a government in exile can take in its current location of residence in order to be recognized as the local legitimate government. Hence, Taiwan’s current international problems have arisen from the fact that the ROC government in exile is not internationally recognized as the legitimate government of Taiwan.The situation has not changed. There are no treaties which change the status of Taiwan since the San Francisco Peace Treaty.Taiwan is still an occupied cession.The US is still the primary occupier.The US has continued to delegate the occupation to the ROC government-in-exile.The ROC has stopped claiming to be the rightful government of China since 1991, and so they have no reason to continue to exist. The elements of the ROC which are trying to Taiwanize the ROC are attempting to transform and rename the ROC and make it the legitimate government of Taiwan. They say that since it is now democratic that it is now legitimate. This is not so. Democracy is not relevant to the issue. Half-way measures will not be effective in international law. The people of Taiwan must overthrow the ROC, with a revolution if necessary. The ROC is an inherently foreign government which cannot be legitimately used to represent Taiwan. They need to wipe the slate clean.The truth and facts of the matter will be surprising to most people.